A fine day on Lake Atlantic. While we were loading our gear, the morning air was still but crisps. The sunrise was painting the high thin clouds with deep shades of orange and red. What a great day! Our trip today, aboard the Independence II was scheduled for the Tolten. This was another one of those wreck that I’ve never been on. Each time I’ve scheduled, I’ve been blown out. Captain Dan also had some numbers he wanted to check out if we had time. Today held promise. We cleared the inlet into near flat seas. The occasional one foot roller went by. The ride out was smooth but cool, so we headed into the heated cabin. We were a couple divers short of a full boat, but this made for more room in the cabin, and more room for catch in the cooler. We were quickly out to the wreck, but found a fishing boat anchored in place. They offered to share the wreck, so we tied into the bow. The seas were still flat, and the surface was very clear with no current. Once we were tied in divers quickly hit the water and dropped straight down. There was no current, no waves, and 40-50 ft of visibility! Sweet! The Tolten was a 280 ft freighter sunk by a torpedo in 1942. She’ lies in 90+ ft of water with 15-20 ft of relief. As we hit 40 ft the beacon became visible. At 50 ft the outline of the bow came into view. I leveled out at 60 ft to take in the view, and get my bearings. We were tied into one of the two chains at the bow. The winch and engine used to lift them was exposed with the gears clearly visible. To the right and left were large davits. Beyond this section a large debris field could be seen. There was plenty of ambient light on the wreck. A light would only be needed to look for bugs. The wreck was covered with fish. A large Schools of Scup was swimming just off the port side. The school would turn in unison lighting up the water with the reflection off their silver sides. Cunners were ever present, nipping at the wreck here and there, watching our every move to see what we might stir up. 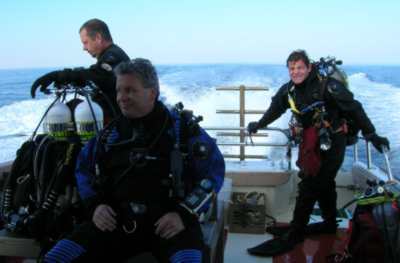 As we crossed over the top of the wreck a large 4+ ft Jack glided slowly by. Seabass were here and there, and an occasional Tog would poke out from around the corner. Sea robins and skates swam about on the sand with a winter flounder here and there. Even a school of Atlantic Spadefish stopped by briefly. Off in the distance a few Spiny Dogfish would sneak around. Since I beat Bill into the water for once, I figured it was my best opportunity to look for bugs. Normally there aren’t many left when he is around. There were quite a few on the small side. Before long, Bill swam by and waved. I pointed him to a larger one beyond my reach, as I continued to work on a 4 lb’er I had cornered. As it turns out they both had eggs, and I was empty handed for the dive. During the fight, I had overstayed my time, and paid the price in deco. Hanging on the line was easy with no current, but the water temps seem to be warmer on the bottom or maybe it’s just deco. Either way the temp read 57 degrees. During the surface interval, some of the high clouds cleared letting the sun through to warm us up. Other divers had better success, and the cooler was filling up with some good sized bugs. We regretted that Louis was down in Florida diving the Ghost Fleet. This left us to our own meager lunches. Next time we’ll have to put in a real order. I grabbed my pole spear and headed back for the second dive. The sun was higher in the sky now, and some of the clouds had cleared. Light on the wreck was better, and vis seemed better also. I leveled off 10 ft from the wreck and headed aft. This time I was in search of Seabass. A few of the larger ones were coaxed into my catch bag by the time I reached the boilers. These two cylinders stood some 20+ ft tall. Normally they are good place for fish to hide. I continued aft along the large prop shaft. On the port side of the rudder I ran into a large cube 5 foot on a side with a chain attached to the top. Off to the one side leading away from the wreck was a chain pile. The rest of the divers got aboard adding more lobsters to the cooler. Scott pulled the hook and we got underway. Since it was still early, Captain Dan headed out to check out the numbers. With the flat calm conditions, we could easily do a buoy dive to check them out. A few of us stayed in gear ready for a quick look-see. Unfortunately, the numbers didn’t pan out, so we headed back. All in all, it was a sunny day with flat seas, 57 degree water, and 50 ft of visibility. A great day!